If you had a tooth extracted and wanted to replace the missing tooth, it’s possible that your dentist recommended a dental implant. Implants are an excellent choice for tooth replacement because they are considered permanent and they don’t require much extra care when it comes to keeping them clean and in good shape. If you have been wondering what your maintenance routine will look like once you have your dental implant placed, read on to learn more. For the most part, once your implant site has healed and the crown has been placed, you should treat your implant like you would treat any other tooth in your mouth. This means you should brush it twice daily with a soft brush and floss between it and any adjacent teeth once daily, preferably before bed. One important difference might be in the toothpaste that you choose: Avoid abrasive toothpaste, such as the type made with baking soda. These can damage your implant by scratching its surface. Ask your dentist what type of floss you should use. He or she might prefer that you use a special tiny brush or a water irrigator to clean out between your teeth and keep your gums clean and debris-free. In some cases, the tooth implant itself or the crown could irritate your gums. If you notice redness, swelling, food getting caught between your teeth or bleeding while flossing, get it checked out sooner rather than later. Having this situation addressed will not only keep you more comfortable, but it will also reduce the chances that you will have a complication that could ultimately lead to a dental implant failure. Since a titanium dental implant contains traces of nickel, it’s possible that you could have a rare allergic reaction if you are allergic to nickel. Some of the symptoms include ulcers in the mouth or swelling, so if you notice any of these, contact your dentist. Talk to your San Diego dentist about whether you should stimulate your gums after your dental implant is placed. Stimulation can help your gums heal and improve blood flow to the area. It can also improve the outcome if a bone graft was used. Options to stimulate your gums include a water irrigator unit and a rubber tip stimulator. If you have dental implants or other appliances in your mouth, it’s important to see your dentist at the recommended intervals. For many patients, this will be twice yearly; sometimes, however, patients are asked to return every three months. 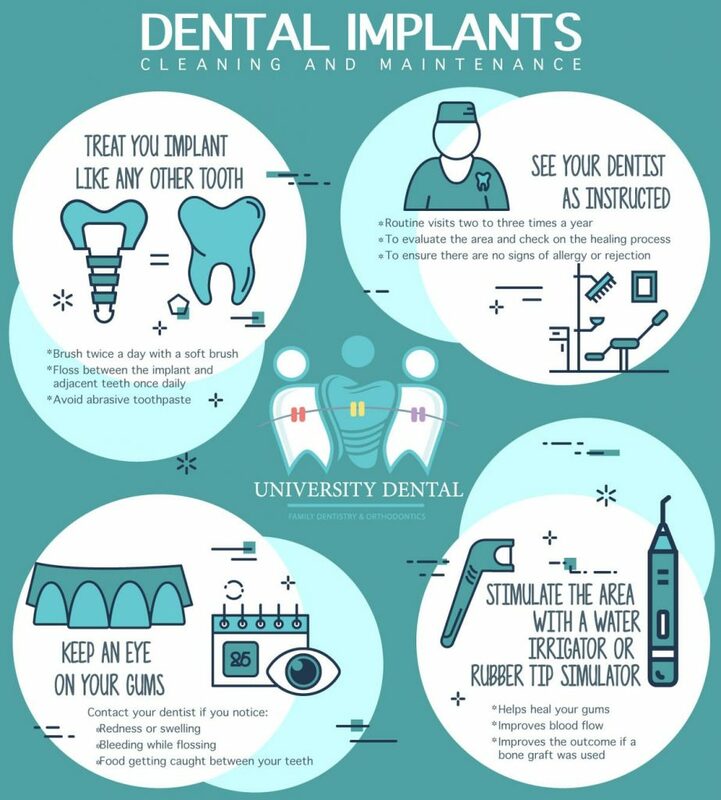 Following these instructions will give your dentist a chance to take a look at how your implant is doing. He or she can evaluate the area to be sure that healing is progressing as expected and also that there are no signs of allergy or rejection. 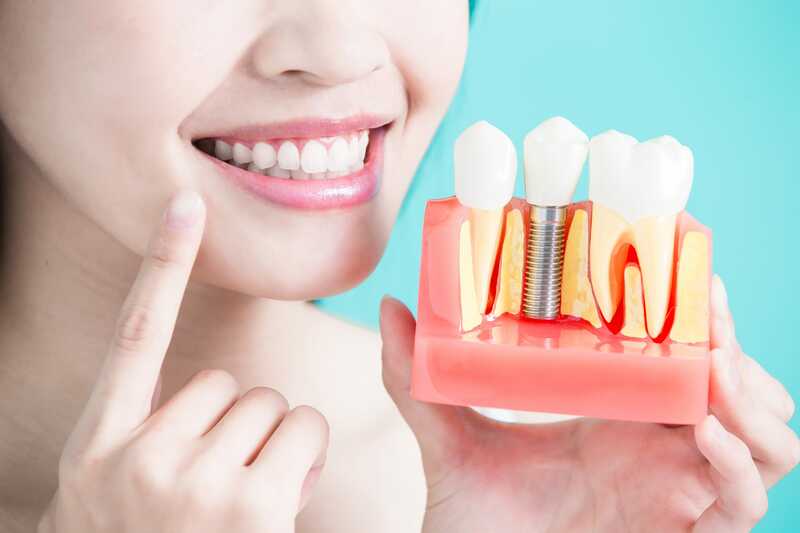 If you need to have one or more teeth extracted or if you are already missing teeth, your San Diego dentist can help you decide whether a dental implant is the right option for you. The University Dental offers same-day dental implants in some cases. Please call us today at 619-582-4224 to schedule a free consultation. We can go over your options and schedule you for your tooth replacement procedure at your convenience. There’s no need to be without teeth; call us now!